Although Mochi ice cream is great throughout the year, we know our customers love our delicious ice cream bites in the summer time. In the blazing heat of summer, nothing is better than a sweet, cold treat to cool you down. No matter if you’re enjoying a sandy day at the beach or celebrating the good weather with a cookout, popping a piece of Mochi ice cream in your mouth can cool you down in an instant. During the summer time, our light, sweet, and crisp flavors fly off the shelves. Below are our most popular Mochi ice cream flavors that will help you beat the heat this summer. Strawberries are one of the many popular fruits of summer. The fragrant, sweet flavor combined with the rich texture of ice cream can make for the perfect combination. Strawberries have an almost candy-like flavor, which is muted a bit by the soft vanilla cream flavor, which creates the perfect pop of fun for the whole family. Because our ice cream is wrapped in our authentic Mochi covering, you can experience the convenience of eating ice cream bites on the go. Mangoes are packed with sweet, juicy flavor. Sinking your teeth into a perfect ripe mango while soaking in the sun on a hot summer day is something you probably dream about. We have made this daydream a bit more appealing by creating our popular Mango Mochi ice cream bites. 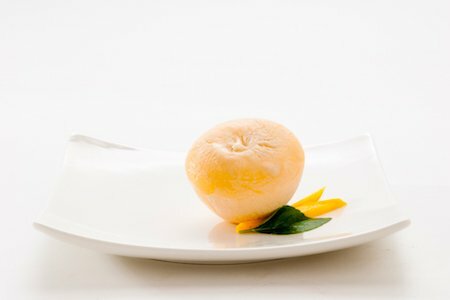 Our Mochi ice cream is created in a way that every bit of the intense mango flavor is present in every bite. You will experience the tartness and texture of the fruit with each and every bite you take. The rich flavor will transport you to a tropical beach far away where your worries and stresses vanish. Also, no matter where you go, your Mochi will go with you. These poppable bites are wrapped in our savory Mochi dough, making it easy and mess free to eat your favorite frozen treat. Mint Chip Mochi ice cream is a great flavor for the summertime. The cool and refreshing, ice cold mint flavor is the perfect pick-me-up after a long day in the sun. The crisp mint and savory chunks of chocolate chips are wrapped in a thick layer of our signature Mochi dough. Pop in a minty frozen treat to start your summer off right. Green tea is a traditional Japanese ice cream flavor that is becoming increasingly popular in the United States. This ice cream is commonly created by blending Matcha green tea powder with vanilla ice cream. This makes the overall green tea flavor a little more muted, allowing for an enjoyable overall taste. Green Tea Mochi ice cream is one of our most popular flavors. The light, subtle green tea flavor, combined with the creamy texture of our Mochi dough is a mixture that our customers can’t seem to get enough of.